All Jackpots Casino is an online casino including mobile games, established in 2003 using games powered by the Microgaming software. It is operated by Digimedia Ltd and is licensed under the jurisdictions of Kahnawake and Malta. All Jackpots Casino was created in 2003, and it is one of eight online casinos owned and operated by Digimedia Ltd. All Jackpots Casino uses Microgaming Viper software and Quick-fire, which provides great game variety. It has both an instant play option and a downloadable option. They even have a mobile option. Over 400 gaming options are available at All Jackpots Casino. All Jackpots Casinos is licensed in the jurisdiction of Malta, and the website carries the seal of eCOGRA, so gaming there is certified both safe and fair. The gaming lobby isn’t too exciting, this is because of this online casino’s focus on functionality. Direct links are provided to each game types, which makes finding the game that the player wants pretty quick and easy. The software is available in five languages, and United States players are accepted. It also accepts several forms of currency, including United States Dollars, Canadian Dollars, British Pounds, and Euros. Withdrawal and deposit options vary by country, so players must choose their country to see what types of payment methods are available for their particular country. Large progressive jackpots are a prominent feature at All Jackpots Casino, and this online casino offers some of the largest progressive jackpots on the internet. All Jackpots Casino offers a welcome bonus package based on an $800 on your first three deposits. All Jackpots Casino requires the player to wager the bonus at least thirty times before the player can cash in on the bonus provided. The welcome bonus is only good for thirty days, which means that the bonus money must be wagered within those thirty days in order to collect anything on the bonus money. Second and third deposit bonuses are usually also available. The second deposit will give a 50% bonus while the third deposit will provide a 50% matching bonus. These progressive bonuses are a great way to keep new players depositing money into the online casino. All Jackpots Casino also has a program called the $4,000 Yearly Player’s Bonus. Using that bonus, All Jackpots Casino will match all of the player’s deposit at an extra 10% cash back up to $350 per month. Of course, the same thirty-time wagering requirement also applies to this bonus as well. In addition to this bonus, there is also an active loyalty program available. For every $10 that the player spends, they will get bonus money to spend on games later. Players can also exchange these points for prizes that change every few months. All Jackpots Casino uses Microgaming software. Microgaming is one of the most experienced software providers. It was developed in 1994 and has an extensive library of hundreds of online casino games. microgaming’s popularity definitely contributes to the large progressive jackpots that All Jackpots Casino is well-known for. microgaming is available via download, but that is also why the games have great graphics and work so well. After the initial download, the game works well, even on some of the oldest operating systems. If the player does not want to download the software, there is also an instant play option. The instant play option does not offer all of the downloadable games and the downloadable version does not offer all of the instant play options. The mobile version also offers a large number of games that players can play on the go as well. All Jackpots Casino is licensed by the Lotteries and Gaming Authority of Malta. All of their payout percentages are published on their website, and they are updated on a monthly basis. They are also accredited by eCOGRA, which is the leading authority on safe and secure gaming. Payments are handled within 48 hours, and all players must go through an identity verification process. This progress helps prevent fraud. One of the best features of All Jackpots Casino is its extensive game collection. There are over 400 gaming options. 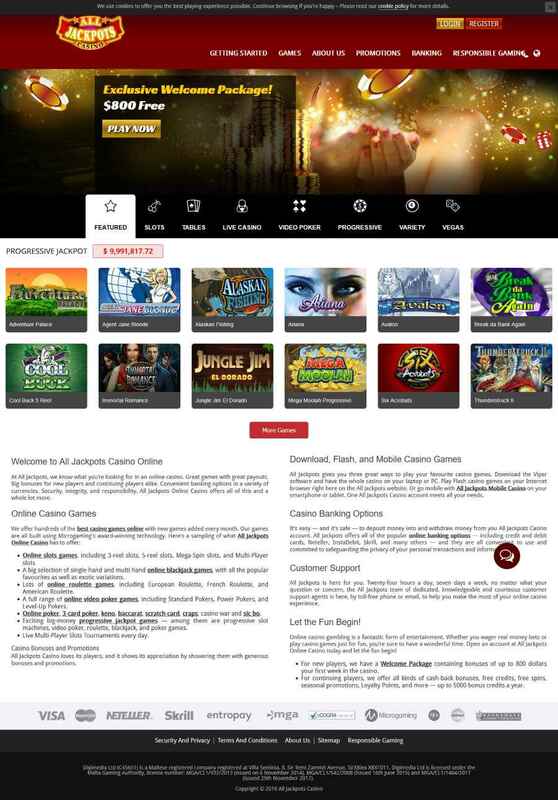 With more than 400 online casino games, and live dealer games, software run by Evolution Gaming, there is bound to be gaming that fits every online casino player’s tastes. The average online gaming site has under 200 games, so having this many options is a rare feature. Most of the games are slot games, but there are also video poker options and other video-based games. Video Poker is available here in many different varieties. The one feature that is most striking is the Progressive Jackpot provided with games at All Jackpots having to show for themselves significant records in progressive value. Many slots games give the possibility of a progressive jackpot. The most popular ones are King Cashalot, Cash Splash, Major Millions and Wow Pot. Jackpot Deuces together with Supajax, Triple 7ís Blackjack, Roulette Royale, and Poker Ride although Slots also offer this feature. Traditional table games are also available, including blackjack and roulette. In fact, All Jackpots Casino offers several version of roulette, including American Roulette, European Roulette, French Roulette, and Gold Series online roulette games. There is even a multiple player roulette available that allows players to play with one another and chat amongst themselves. Other table games like craps, keno, baccarat, and three card poker are also available. All Jackpot Casinos also offers scratch card games, sic bo, and casino war. All Jackpots Casino also offers slot tournaments that have low entry fees so they apply to a large range of online gamblers. The smallest tournaments have just a $2 to $6 entry fee. Some of the largest prizes available are roughly $5,000. Customer support at All Jackpots Casino has gotten good reviews. They have instant messaging for customer support, and they also offer contact methods of e-mail and telephone. The telephone options will vary depending on what country the player is from. Players from Canada, Australia, Germany, Italy, the Netherlands, and United Kingdom players all have separate numbers for customer service. Other worldwide players also use a different number. Live chat is not available 24 hours a day, 7 days per week like some other online casinos. Instead, it is available 10 to 12 hours per day. Customer service has been helpful, although they may be a little bit slower than desirable. However, the online casino also offers extensive information on their website, so players may want to check there before checking with customer service.